On Sunday afternoon, November 22, one hundred singers — including Middlebury College students from across the globe and residents from nearly every town in Addison County — will take their places in the choir pews inside Mead Chapel as the Middlebury College Community Chorus presents its annual Thanksgiving concert. This free, hour-long performance begins at 3:00 p.m. and is open to all. The program includes a mix of exciting classical choruses alongside newer works. 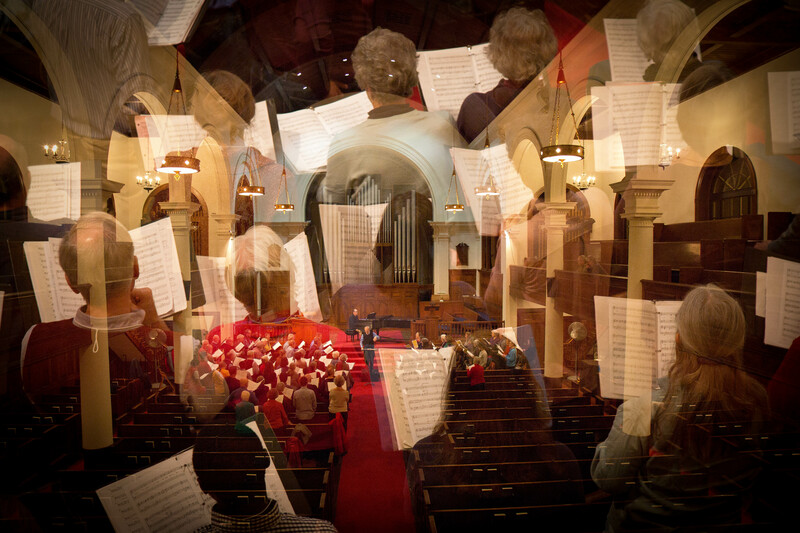 The choir will offer the magnificent first movement of J. S. Bach’s Magnificat; Felix Mendelssohn’s setting of the Thanksgiving chorale Now Thank We All our God; and the final choruses from G. F. Handel’s Messiah with the thrilling counterpoint of voices singing Blessing and Honor… Amen! Works by contemporary American composer-conductors include an exciting setting of a thanksgiving psalm, Jubilate Deo (Make a joyful noise unto God) by David N. Childs, and the beautiful Pilgrims’ Hymn by Stephen Paulus. The choir presents Soulspeak by Z. Randall Stroope, a brand new song with an inspiring text from Alfred Lord Tennyson’s Ulysses. Also slated is Jeffery Ames’s Let Everything that Hath Breath, an uplifting gospel song with its driving rhythm, as well as a beautiful new arrangement by Craig Courtney of Let There Be Peace on Earth. Conductor Jeff Rehbach notes that the Chorus is privileged this season to perform two works by members of our local communities. Sally Hoyler, well-known in the community as Ripton town clerk and a long-time member of the Chorus, succumbed to cancer in early 2015. In her memory, the chorus will sing a beautiful, flowing song that she composed several years ago that begins with the lyrical text “Ocean, ocean sing to me the silent music of the soul.” The choir will also premiere a brand-new work, A Blessing for Dear Friends, written by Nathan Wallace-Gusakov. Nate grew up in Bristol and now lives with his family in Lincoln and appears frequently playing banjo with music groups in the area. His composition offers hope for peace and love, light to guide the way, and concludes “may you come home to love” – a fitting sentiment for this Thanksgiving program. 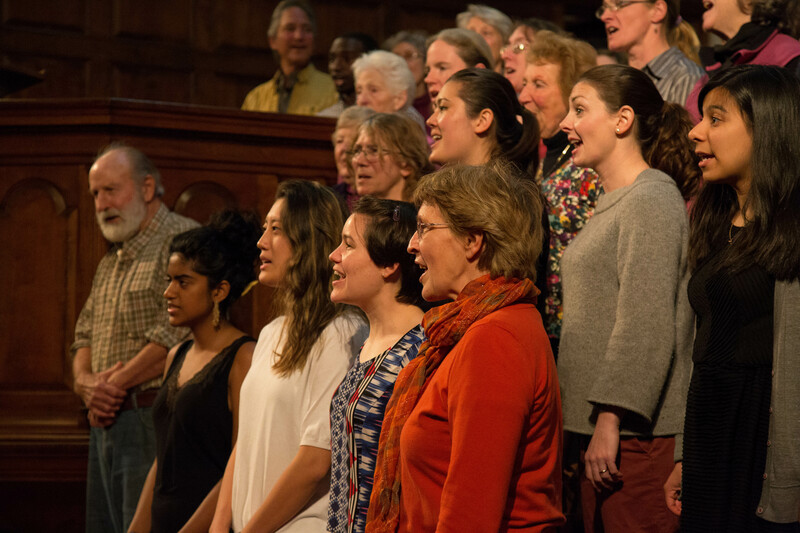 Members of the College Community chorus travel for weekly rehearsals from throughout the region, including Cornwall, Weybridge, Middlebury, Ripton, Goshen, Bristol, Monkton, New Haven, Waltham, Vergennes, Ferrisburgh, Charlotte, East Middlebury, Salisbury, Leicester, Brandon, Rutland, Orwell, Shoreham, Addison, Port Henry and Moriah. College students hail from Vermont, Maine, New York, Massachusetts, West Virginia, Pennsylvania, New Hampshire, Rhode Island, Illinois, Hong Kong and Kenya. Jeff Rehbach is in his sixteenth season as conductor of the College Community Chorus, and Timothy Guiles serves as the ensemble’s remarkable accompanist. The group is open without audition to all singers who delight in participating in this 150-year-old community tradition, hosted by Middlebury College. For up-to-date information, check on the web at http://go.middlebury.edu/communitychorus or contact director Jeff Rehbach at 989-7355.